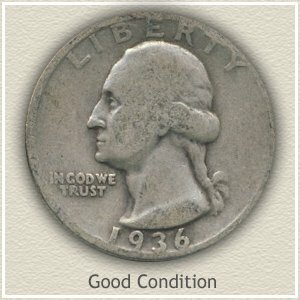 Your 1950 quarter value starts at $2.80 , the price of silver is raising how much it's worth. But often raising the value of old quarters are mint marks and condition. 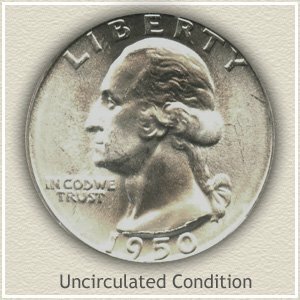 Find an "Uncirculated" example and the value is at least $3.27 with the "S" mint 1950 Washington quarter worth over $3.76 in "uncirculated" condition. The quickest to check for different values are mint marks. Three minting facilities produced Washington quarters in 1950, Philadelphia, Denver and San Francisco. The two most valuable in the higher grades are the Denver and San Francisco coins. The "D" or "S" mintmark, indicating the specific mint, is found on the reverse. To reach higher values your coin must be in nice condition and exhibit great detail. The 1950 quarter pictured is an outstanding example. In this condition it is worth considerably more than the minimum silver value. 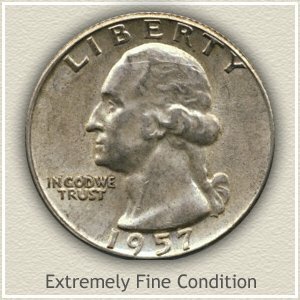 Identifying mint marks and especially condition accurately, combines to reveal how much your 1950 quarter is worth today. 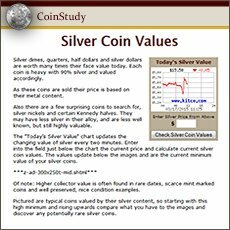 The terms used in the coin values chart about the condition of your quarter are described in detail below. A date listing of "1950-S" is a quarter minted in 1950 at the mint in San Francisco. In 1950 the mint marks on Washington quarters are found on the reverse just below the wreath. The quarter images below each represent different levels of desirability to a collector. From the "Uncirculated" grade, the most desirable, to the least, "Good" condition. 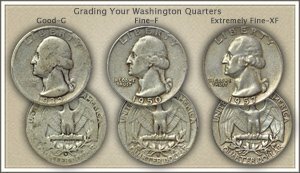 Accurate 1950 quarter value depends upon a careful study of grade. This process is understandably one of the hardest to get correctly, especially when large dollar amounts are at stake. Extremely Fine: Still sharply defined with abundant detail remaining, the high points of the hair, curls above the ear, the cheek and neck line show slight wear. The coin should standout as one decidedly better from most. Good: All the major details show but very flattened by wear. The tops of the letters have begun to merge into the rim. 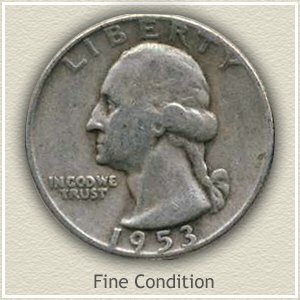 A 1950 quarter typical of this condition trades at its underlying silver bullion value. Including more relating to your 1950 quarter value. Easily find how much your old coins are worth. Selling coins is always a challenge. 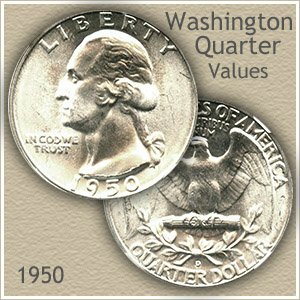 However you have taken big steps towards understanding what is involved to accurately determine your 1950 quarter value. Insuring you get the best deal when selling coins. From the denomination of the coin, to locating mint marks, to examining and judging its condition and deciding a Grade. 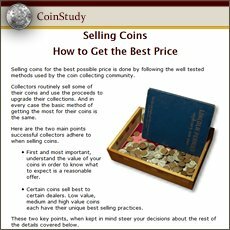 This understanding of how to value old coins yourself helps greatly when dealing with any future buyers of your coins. Look through your box of old coins, discover any treasure hiding inside. Research them, not only on this site, but others. Now you can decide if and when to sell your coins.